Urban homesteading, sounds kind of trendy and cool, doesn’t it? It also sounds kind of contradictory. Urban means city and homesteading means country. How can ever the two meet? Urban homesteading, although at face value seems to incorporate two conflicting ideas, is a cool possibility that is becoming a trend among individuals who wish to ditch consumerism, think outside the box and embrace a new lifestyle. So, what is urban homesteading anyway? 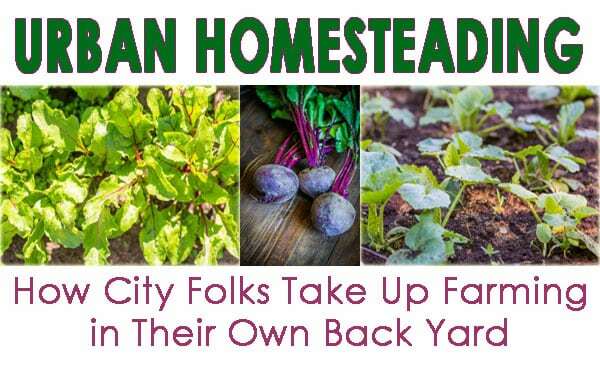 Quite simply, urban homesteading is the practice of taking a piece of land, usually a small piece of land, within an urban setting, and transforming it into a productive, sustainable homestead capable of producing food that an individual family needs. Why would anyone want to do this in the first place? Well many people harbor dreams of living a life of simplicity that is more closely connected to the land. Homesteading allows them to do this. It also allows an individual to take charge of the food they eat and have a real handle on how it is grown. Regardless of your particular reasons for wanting to take your backyard garden to the next level, the important thing to remember is that this is attainable for anyone who is willing to work for it. A successful urban homestead does not sprout overnight. It takes planning and patience, but that is not to say that you can’t get started right away. The fact is you may have already started, and you don’t even know it. If you already enjoy working a family garden, then you have already taken the first step toward urban homesteading. Following you will find some tips that can help you take your regular family gardening to the next level of urban homesteading. Do you simply want to have some fresh produce on the table in season each year? If so, you can probably accomplish this with your simple family garden, or by making use of the local farmers market. Individuals who wish to turn their property into a true urban homestead, often have strong feelings about where all of their food comes from and how it is sourced. In today’s society, consumerism is king. Consumerism drives our entire society, and if you really think about it, controls so many of our decisions. Even the career path we choose in life is often dictated by what kind of “standard of living” we wish to maintain, and that standard of living is based on what? Stuff. Will we be able to buy all the stuff that we want? Homesteading kicks consumerism off the throne and places you there. The individual should have the power to create what he needs himself. When an individual is given that place of power back, they can make authentic choices, which in the long run are better for the environment and our individual health. It is vital that you understand your area in order to be a successful urban homesteader. The good news is that Southern California is considered by many as the birth place of urban homesteading. In the mid 80’s families began realizing the huge potential which the Southern California climate offered to folks wanting to grow their own food even within the confines of the city or suburbs. Even though the climate is ideal, it is still very important that you do your homework so that you are aware of laws and neighborhood restrictions concerning what you can and cannot do with your property. Homesteading is a huge investment of time and energy, so it is far more wise to get the information first before you begin a certain project. Otherwise, you might invest a great deal of time and energy into something only to be told later, by the city or your homeowner’s association, that something is not allowed. Homesteading is one of those ideas that can get really big really quick. If you are even entertaining the thought of urban homesteading, then you are probably a dreamer anyhow. You will need to be careful, however, to keep your dreams in check with your reality. If you do not have a great deal of money to invest right now in equipment or materials ,then start small. Begin with a few raised beds. Raised bed gardening is a wonderful way to get immediate growing satisfaction without amending soil, tilling ground or searching for “just the right” spot in the yard. Raised beds are versatile and mobile, giving you the power to literally start your homestead anywhere. When planning what you will raise in your urban homestead it is important that you only invest time, energy and money into food you and your family will eat. If there is surplus you can always share or sell the abundance. Growing an item just with the intention of selling it, however, can prove to be a waste of time. If the item does not sell, and your family does not eat it, then you have quite literally wasted that effort. If you grow items your family will eat, then even if it does not sell, your family can still eat it and therefore you have benefited. Homesteading is an old art, with many sub skills involved. Unfortunately, over the decades many of these skills have been lost. In order to have a successful urban homestead, you will need to make the effort to learn these lost skills. The most important of the lost skills is preserving the harvest. Preserving the harvest is crucial to ensuring that the food you grow during a specific season, will continue to sustain you for months after. In order to be a successful homesteader, you will need to learn from those who have done it before you. This will require a good deal of humility and good humor. There will be failures along the way. The important thing is to keep a good attitude and always stay in a learning mode. There are plenty of organizations in Southern California which help educate individuals in sustainable living and farming. It may be tempting at first to buy a lot of stuff in your excitement to embark on this journey. Stay realistic. Talk to others who are living this lifestyle and learn from them what is and is not important to begin with. You will very likely want to invest in raised beds and a composter. A good quality composter will be worth the investment many times over once your urban homestead is up and running. Although urban homesteading is not an undertaking to be rushed into, there is no reason that any family in America could not be successful at this lifestyle. Dedication, hard work and a willingness to learn are all that is required to turn your backyard garden into a thriving urban homestead.